True, lasting anger control is yours--you're halfway there just because you've landed on this page! The right Anger Management Techniques will give you the quick relief and lasting control you're looking for! Controlling anger includes anger release, meaning expressing anger in a healthy way is an essential component to effective anger management. Most people think of anger management as just keeping it inside, or making it go away somehow. That just doesn't work! Understanding anger and where it comes from. Identifying the difference between healthy and unhealthy expression of anger. Finding out the unresolved issues and childhood issues behind anger management problems. Learning the skills for healing the pain and trauma underlying anger. 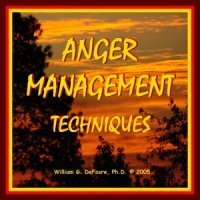 Mastering the methods and techniques for releasing and expressing anger in everyday life and significant relationships. This is no small task...but you can do it! You've got what it takes to heal your anger and learn to manage it effectively on a daily basis. Everybody needs tools. Here is our most powerful tool, an audio CD/download program available also in Ebook form, which you can get right now with our no-risk full guarantee. Take advantage of this excellent offer and become your own best anger management resource! Don't miss this great opportunity! 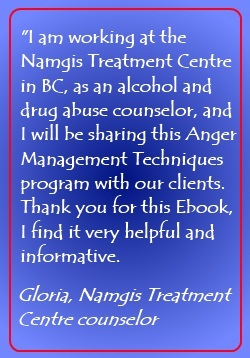 There are lots of anger management CDs out there, but before you move on, take a look at the incredible amount of information available on this single anger management CD/download! Quick Relief--You want something now! Well, you will get that quick anger control with the anger management strategies you will find in this program. The techniques you will learn can be used any time, anywhere! Lasting Control--Obviously, you want the anger control to last! You don't want to end up in the same miserable mess over and over again. So, some of the anger management techniques you will get in this highly effective program get to the heart of the matter to create anger control that will last! Still not sure? Well, consider this--you have nothing to lose! That's right, we offer a full, no-questions-asked money-back guarantee. So, just give it a try. Your family and friends will thank you. And you will be glad for your investment of time, money and energy to learn this approach to anger management.